Even longer ago, white men came and took away the children to make them fight in their wars, using the pen to enlist them. The boy still suffers from the cultural consequences of this symbolical curse. Unearthing the Pen is an intimate portrait of a boy's struggle to reconcile tradition with his desire to learn. "My forefathers buried a pen, putting a curse on the written word. Is this why I can't go to school?" 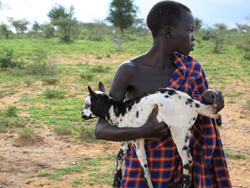 says Locheng, a young goatherder in northern Uganda. (For trailer click image. Opens in new window).